Manners Try-it – This class meets the requirements for your Daisy or Brownie’s to earn their Manners Try-it! 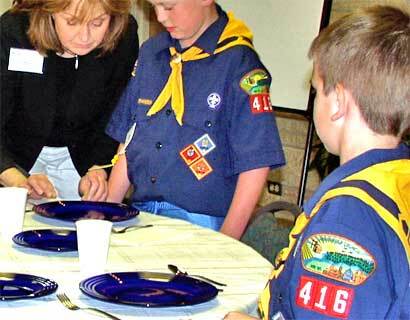 The Mannerly Manners® has been working with the Girl Scouts, Boy Scouts and other Community Groups for 10 years. Our core program can be customized for different groups with specific learning environments and agendas. Keeping the basic principle of “teaching manners with respect ”as the foundation for the program, we modify the activities and presentation to make the material appropriate for your group. We have customized classes for Girl and Boy Scout Troops, the Girl's and Boy's Clubs of America, The 4-H, home school groups, etc. Have a badge your group wants to earn, let us help you meet the requirements. The age and number of participants determine class activities and cost. Every student receives original hand-out materials.